The immediate response- following Tuesday’s dramatic developments, was to dismiss the testimony of Porton Down CEO Gary Aitkenhead as unimportant. ‘Porton Down lab probably baffled by the fuss over this interview’ tweeted the BBC’s Security Correspondent Frank Gardner. ‘Porton Down wouldn’t be able to say where the nerve agent was from anyway’ was the oft-repeated refrain. The trouble is that we already been told that the laboratory HAD identified the nerve agent as coming from Russia. Foreign Secretary Boris Johnson said as much in an interview on German television on 25th March. In addition, the Foreign and Commonwealth Office tweeted on 18th March ‘Analysis by world-leading experts at the Defence Science and Technology Laboratory at Porton Down made clear that this was a military grade Novichok nerve agent produced in Russia’. After the interview with Aitkenhead, the tweet was deleted. I wonder why. — ITV News (@itvnews) 4 апреля 2018 г. The next tactic of the Official Narrative peddlers- after downplaying Porton Down- was to promote the importance of the ‘Intelligence led assessments’ that point to Russian guilt. Of course, we plebs can’t see any of these ‘assessments’, we just have to accept them 'on trust'. ‘28 countries have been so convinced by UK case they have expelled Russians’ tweeted Boris Johnson. Well, 29 countries (excluding the US and UK) supported the illegal invasion of Iraq in 2003 on the basis of US/UK claims about the country possessing WMDs-and look what happened there. Moreover ‘28 countries’ only amounts to 14% of all the countries in the world. If we’re talking about them as a percentage of the world’s population, or land mass- it’s much less than that. The fact that a bunch of NATO allies plus Australia sided with Britain- after the British Ambassador to Russia had declared there was ‘no doubt’ Novichok was used- and there was ‘no doubt’ that Novichok was ‘produced in Russia by the Russian State’, proves nothing. Most, in any case, have only expelled one or two diplomats. The likes of Israel, Portugal and Cyprus, nations you’d expect would support the UK, haven’t expelled any. Which is surely significant in itself. 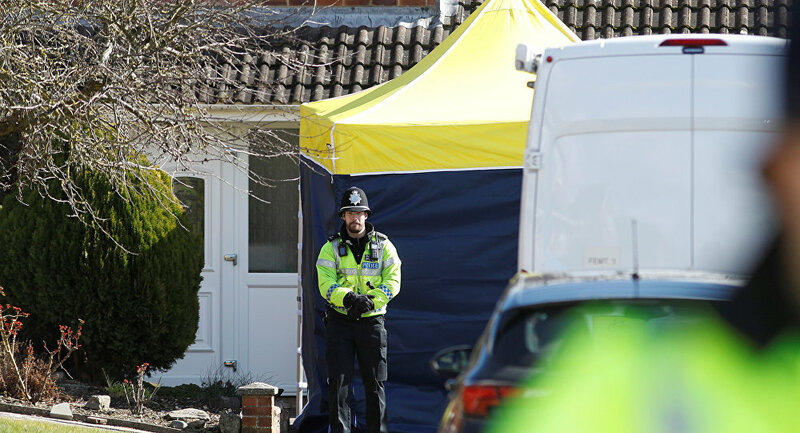 Police went in and out of #Skripal door for 3 weeks, before they found the “nerve agent” — at the door. — Tore (@potifar66) 30 марта 2018 г. Meanwhile, we’re being told that the nerve agent which poisoned the Skripals was probably placed on their front door handle. Never mind that police officers happily went in and out of said door with no ill-effects. Or that there was significant precipitation in Salisbury on the day when the Skripals fell ill. Now right on cue, we are informed that ‘British Intelligence ’ have ‘evidence’ that the Russia ‘had been testing the deadly agent specifically on door handles in the run-up to 3rd March’. Can we see this evidence? No, of course not. And why- in any case would FSB agents smear the front door with Novichok during a period of snow, sleet and rain? Or didn’t they bother to check the weather forecast? UK Minister of State for Security, Ben Wallace, wriggling like a box of worms on #bbcr4today re #SkripalCase intelligence. Their case has unravelled and now it's an exercise in news management and damage limitation. It is the Iraq dodgy dossier redux. — John Wight (@JohnWight1) 5 апреля 2018 г.
There’s also been a change in the ‘party line’ on Novichok. It was, we were told, among the deadliest chemical agents known to man, up eight times more deadly than VX- which, remember, had killed Kim Jong-nam in just 20 minutes at Kuala Lumpar airport in 2017. — Media Lens (@medialens) 5 апреля 2018 г. But if so deadly, and fast-acting, how come it took so long to affect the Skripals on 4th March, and how come both are still alive- with Yulia saying in a telephone conversation broadcast in Russia on Thursday, that she had regained consciousness a week ago and that her father was doing fine too? And all this after we were told that life support machines may have to be switched off- and The Times newspaper actually reporting, on its front page of 12th March, that Sergei Skripal was already dead. The answer it seems is that Novichok doesn’t have to be so deadly and fast-acting! It seems that it can be quite slow in affecting the nervous system. And that you don’t need an antidote either! — John Wight (@JohnWight1) 29 марта 2018 г. As the Skripal case goes from tragedy to farce-and begins to resemble a ‘Carry On’ film, (with Boris Johnson a less funny and more 'weight-challenged' version of Kenneth Williams and the gormless Defence Secretary Gavin Williamson as Jim Dale), the attacks on those who have dared to question the Official Narrative have intensified. On Thursday the independently-minded Labour MP Chris Williamson was savaged by NeoCon gatekeepers for going on RT to say that the UK government was using the Salisbury attack as a ‘smokescreen’. Since the Porton Down statement, I’ve too come under attack from trolls- one of whom had just one follower and was following no one. — Neil Clark (@NeilClark66) 1 апреля 2018 г. The problem that the UK government has- and that no trolls can rectify- is that the ‘Official Narrative’ has more holes in it than a slab of Swiss cheese. The latest story is that Skripal's pets died after being locked in the house. But Skripal's vet "contacted police immediately" after hearing about the incident in March, and the pets were "taken away for tests". — Evolve Politics (@evolvepolitics) 6 апреля 2018 г.
It’s not a matter of being pro, or anti-Putin, it’s just a matter of using basic logic and noting the glaring inconsistencies. Remember folks. We're supposed to take the government's words at face value. Anything else is treasonous. We’re in Emperor’s New Clothes territory now, where the only thing preventing politicians, journalists and other public figures openly coming out and crying ‘But the Emperor’s got no clothes’! is the fear of being labeled a ‘traitor’ or ‘Kremlin apologist/ ‘Useful Idiot’ by the media and NeoCon gatekeepers. But outside of the Westminster/Establishment media bubble and echo chamber- in the pubs and cafes, on the buses, on social media and in all the places where ordinary people congregate, a very different conversation is taking place. The views and opinions expressed by Neil Clark are those of the columnist and do not necessarily reflect those of Sputnik.